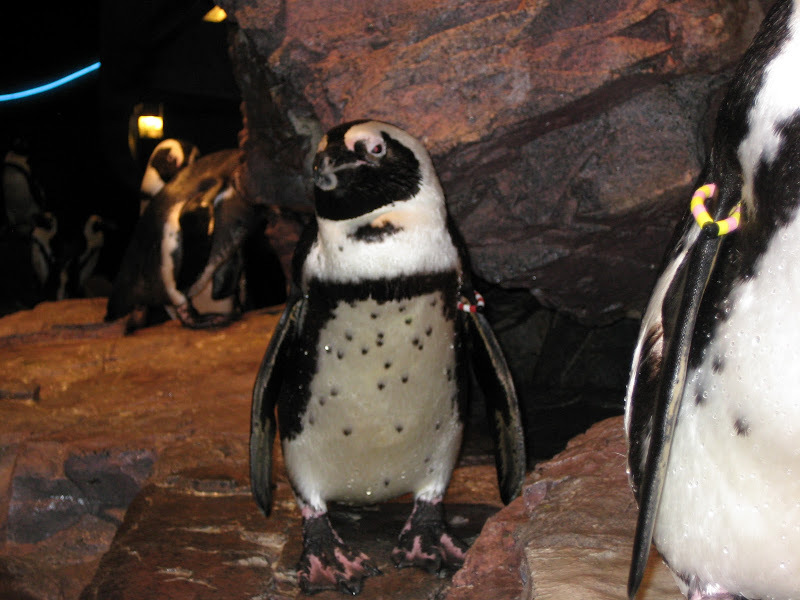 This is Mercury; he is an African penguin with a red and white bracelet on his left wing. He was born at the Aquarium on January 30, 1993. He is named after Mercury Island which is 800 meters (about a half a mile) off the coast of the Namibian desert. It is a seven hour boat ride to the nearest town. Mercury Island is a small (at just over seven acres), steep, rocky island with no vegetation. It also is hollow. When the waves are rough and collide with the island, the whole place shakes, (hence its name). Mercury Island supports the largest Namibian colony of African penguins, and the third largest worldwide with up to 10,000 penguins. It is also an important breeding island for other species of seabirds including the endangered Bank cormorant and the Cape gannet. Mercury Island is managed by the Ministry of Fisheries and Marine Resources, Namibia, and is permanently staffed. Fresh water and food are only supplied twice a year. Until very recently there was no electricity, only candlelight. Since February 2001, the staff house is powered by solar panels.